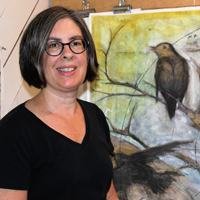 Her work focuses on abstractions found in nature and everyday life. Color, shape, line and rhythm are the focus while the recognition of the landscape or objects becomes secondary. Perhaps because of her early theatre training, Maryanna sees the printing plate as a stage. The artist and the printmaking process interact on it with dialogue and improvisation. Maryanna encourages her students to experiment with the process. The “happy accidents” that sometimes occur when using unfamiliar materials and techniques creates an image rich with layers and depth.